Sea Pines Vacation Home is located at 3 Old Military in a quiet neighborhood of Sea Pines. Its centrally located in Sea Pines and is in close proximity to the beach, Sea Pines Beach Club, Salty Dog and Harbour Town. The property comfortably accommodates 8 people. The property has hardwood floors, updated kitchen, open air living room, wall mounted flat screen and the windows provide views of the swimming pool. The pool has plenty of room for seating, sunbathing and outdoor dining. The inside dining area and kitchen are perfect for gathering. The farmhouse-style dining table seats eight. Nearby is a laundry room with full-sized washer/dryer for added vacation convenience. The master bedroom has a king-sized bed and the outside patio can be accessed through the French doors. The master bath has a tub/shower combination as well as a separate glass door shower, and a wide vanity. The second bedroom includes a king bed, TV and ceiling fan. The bathroom includes a tub/shower combination and a separate glass door shower. The third bedroom has a king-sized bed, TV and a large walk-in closet. The fourth bedroom has two twin beds, TV and DVD. The third and fourth bedrooms share a bath with a tub/shower combination. Sea Pines is where it all started on Hilton Head Island. Sea Pines is a destination where residents and nature live in harmony. Instead of clear cutting land, building homes and then planting trees within the community, residences were carefully built within the mature landscape. Sea Pines is a mixture of short-term rentals and full-time residents spread among 5,000 acres of coastline and forest. There are five miles of sandy beaches along the Atlantic Ocean coastline and another 3 miles along the intracoastal waterway. Perhaps the most famous site in the South is the Harbour Town lighthouse, overlooking the marina and the 18th green of the Harbour Town Golf Links. 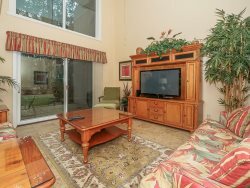 Sea Pines features 3 championship golf course, the Sea Pines Racquet Club, Beach Club, fitness center, equestrian center, community garden, shopping, dining, and entertainment.